Cigarette smokers, shoppers who use plastic bags and potential sports betting and marijuana businesses would help the state pay for additional spending on schools, human services and new classes of Illinois State Police cadets under the spending plan laid out Wednesday by Gov. J.B. Pritzker. Pritzker – as was the case for many of Illinois’ previous governors – inherited a fiscal mess when he took office just more than a month ago. This budget, his first and which he said is more “austere” than he’d like, is meant to serve as a “bridge” to the ones he hopes for the in the future. But like so many governors before him, critics warn that Pritkzer is merely delaying hard decisions, forcing Illinois to tread choppy fiscal waters. The state’s credit rating is the lowest in the nation, and a wrong move could give Illinois the ignoble distinction of dipping into “junk” status. The crucial aspect of Pritzker’s multi-year approach is a constitutional change to pave the way for a graduated income tax. Illinois’ constitution requires a flat income tax; Pritzker campaigned on amending the constitution to allow for a system in which the wealthy would pay taxes at a higher rate. That would require support first from three-fifths of the General Assembly and then approval from Illinois voters during the 2020 election cycle. Pritzker is banking his legacy – and Illinois’ immediate financial state – on a successful overhaul of the state’s tax system. 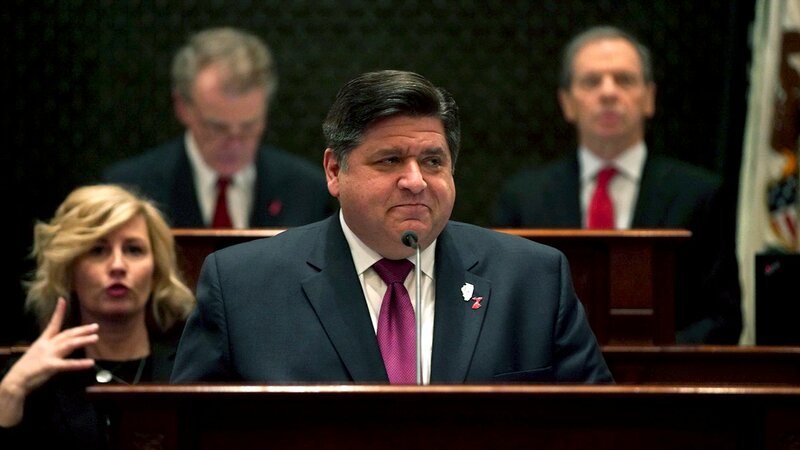 “The state needs a fair tax, and I am going to be relentless in pursuing one over the next two years,” Pritzker said. “To fix our state’s problems, we need fundamental tax reform. There’s no hiding from it. There’s no running from it. There’s no lying about it. I choose a fair tax system to get us out of this mess. It will take 18 months to get it done, but it’s worth the wait so we can save working families hundreds or thousands of dollars per year." And $9.8 million for more child protection and child welfare specialists. Some critics were left wondering just where the austerity part comes in. There is at least one area in which Pritzker plans to cut: Background material provided by the administration indicate the new governor would trim $6 million from a program enacted under former Gov. Bruce Rauner that gives donors a credit on their income taxes for contributing to a state fund that pays for private school scholarships for low-income students. Pritkzer would have still less to spend were it not for his proposal’s reliance on a new pension plan outlined last week by former comptroller and current Deputy Governor Dan Hynes. Cutting away at Illinois’ gnawing $134 billion long-term pension debt means that nearly a quarter of annual operating money goes toward pension payments. Should Pritkzer get his graduated income tax, he said he would dedicate $200 million of the revenue toward pensions. But that’s only if it passes. Other changes call for a $2 billion pension obligation bond that could save Illinois money if done right, or end up costing the state if the markets flop. Another idea is to move lucrative state assets – like buildings, the Lottery or even the Tollway – into the pension funds. Also, Pritzker wants to cut $800 million in immediate pension payments by stretching out the cycle set forth in law that sets a 2045 deadline to be at 90-percent funding; Pritkzer would reset the pension ramp so payments are “more sustainable” by adding another seven years to that target. On the flip side, progressive groups and legislators said Pritzker did not go far enough in seeking to reap more from corporations and the wealthy, money they say could be spent on vulnerable populations. Still, Republican legislative leaders signaled a willingness to work with Pritzker, as the governor and four legislative leaders had their first “leaders” meeting Wednesday morning prior to his speech. Without his recommended changes, Pritzker said state agencies would see 4-percent across-the-board cuts. There’s also the matter of a $900 million deficit in this fiscal year 2019 budget, which ends June 30. Budget director Alexis Strum told reporters the administration is looking to “control costs” in state agencies, but that Pritzker may not be able to fill that gap, meaning at least part of that deficit would carry over.